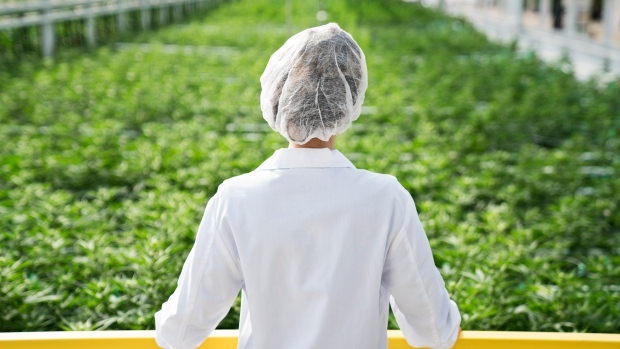 An Aphria employee watches over marijuana crops , Image courtesy of Aphria Inc.
Canadian cannabis companies are focusing on South America as their major next expansion market amid the early stages of a broad global push to secure new areas of growth beyond their home base. Canadian marijuana producers Aphria Inc. and Canopy Growth Corp. are increasingly turning their attention to a market that counts 600 million potential customers, low-cost agricultural exports and growing acceptance to legalizing marijuana recreationally. After Uruguay, the first country in the world to allow legal recreational cannabis, Colombia, Argentina and Chile have legalized medical marijuana with each country hoping to emerge as a multibillion-dollar producer for the pharmaceutical industry. Aphria Chief Executive Vic Neufeld said South America is “truly, very, very exciting” in a recent interview with BNN Bloomberg. The company has a stake in Scythian Biosciences Corp., which acquired medical marijuana producer MMJ Colombia Partners Inc. in April for about US$33 million, and is now looking closely at the continent for further growth. Aphria announced last month it closed a bought deal that raised $258 million in gross proceeds and is now flush with cash the company intends to spend on acquisitions outside of Canada “in a short time frame,” Neufeld said. The company will have 3 million square feet of growing space by the end of the year which should be more than enough to meet the expected demand of recreational marijuana supply once it becomes legal this October. “I don't want any more capacity in Canada. I have everything I want,” Neufeld said. Neufeld identified Colombia and Argentina as key countries that Aphria is strongly looking at investing in, as well as Brazil now that its government appears to be warming up to medical marijuana cultivation. “If you land on the right metrics of a country and can find a license holder that brings solid leadership, knows the process from seed-to-sale, from growing to processing to market strategy, then we’re very interested,” Neufeld said. While Aphria is still planning its South American strategy, rival Canopy Growth made the first major strike, announcing on Thursday it acquired Spectrum Cannabis Colombia S.A.S. to help focus on the emerging medical cannabis market throughout the continent. The deal could be worth as much as US$96 million depending on whether various stock and incentive targets are met. “The way we look at it with every country is will our investment have a positive rate of return in a domestic opportunity,” said Canopy Growth CEO Bruce Linton in an interview with BNN Bloomberg, noting that his company spent nearly two years exploring an investment in the Colombian market.